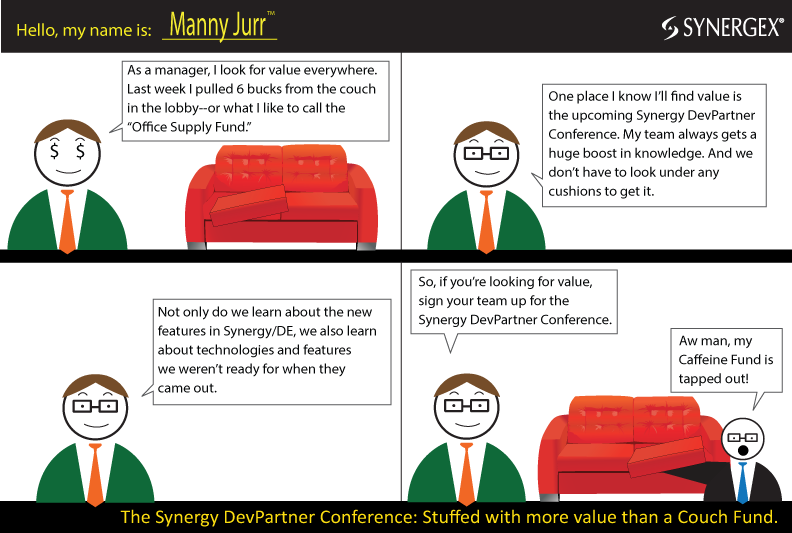 Synergy DevPartner Conference 2014: Stuffed with more value than a Couch Fund. 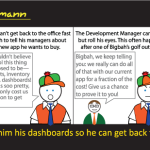 Posted in DevPartner Conference	on Feb 3rd, 2014 | Comments Off on Synergy DevPartner Conference 2014: Stuffed with more value than a Couch Fund. Over the years, you’ve heard about many ways you can advance your Synergy applications—ways to make them look more sophisticated, ways to increase functionality, ways to improve productivity for your developers. But suppose your UI has always been “fine.” Maybe your users weren’t yet asking for relational databases, or new platforms, or new features. 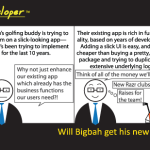 And maybe your developers were content with their tools and their productivity. Until now—NOW they want something, and NOW you need to do something. Is it too late? Should you have paid more attention during the conferences? Never fear. 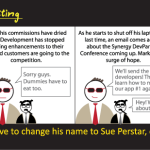 You can catch up on all you need to know about Synergy/DE at this year’s conference. In addition to learning about the new features in our upcoming Synergy/DE 10.3 release, as well as newer technologies such as Android, iOS, Linux, Mac OS, and .NET, you will also learn about the important technologies and features customers have been using the past few years. When developing our conference agenda, we made sure to include the topics our customers asked about most frequently this past year. No matter where you are in your product’s life cycle, the Synergy DevPartner Conference is for you. Register today. The upcoming Synergy DevPartner Conference is packed with informative sessions and tutorials that will show you how to enhance the look and feel of your Synergy/DE-based applications. 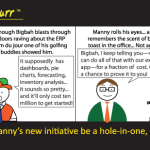 You will hear firsthand from customers who have enhanced their own applications, and will learn the steps they took to get from a cell-based application to a modern UI. And you will be surrounded by Synergy developers who may be exploring the same paths you are, or who may have already accomplished some of your goals and can share valuable insights. Learn more about the conference at conference.synergex.com.